Last time we hear about worlds most expensive iPhone4 covered with diamonds on the side, this time its all about iPad 2 and the digits we are looking into is $8.2 million dollars. WOW!! The man behind all this crazy stuff is Stuart Hughes. Liverpool-based Stuart Hughes has already impressed us with the luxurious TV sets, Gucci diamond belt, Bugatti Veyron Diamond, blinged iPhone, worlds’ most expensive iPhone wallet, the world’s most expensive suit and the world’s most expensive bespoke music center. 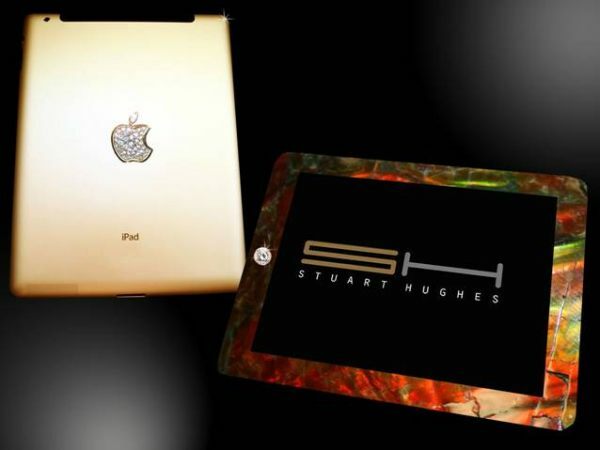 But, this time, Stuart Hughes has done the extreme by taking the wraps off its new iPad 2 Gold History Edition, which costs a whopping £5,000,000 (about $8.15 million). It comes festooned with 12.5 carats of ‘I’F’ Flawless diamonds, a total of 53 individually set sparkling gems done beautifully in solid 24ct Apple logo with rear section formed again in 24ct gold, weighing in at 2,000 grams. The main front frame is made from one of the oldest rocks in the world, Ammolite, which is sourced from Canada and is over 75 million years old. To add to the individuality, sections of a 65-million-year old T-rex dinosaur’s thigh bone was splintered and then shaved into the Ammolite, then finished off with ultimate jewel. A single cut 8.5ct flawless diamond has been inlaid in its own platinum surround with 12 outer flawless diamonds. The highlights include 16.5 ct diamonds & 8.5ct single diamond, 57 grams of T-rex bone, 750 grams of Ammolite stone and 2000 grams of solid 24ct Gold. Only two iPad 2 Gold History Editions will be made available.